Depending on whether we diagnose periodontitis, periodontal pockets, excess tooth mobility or inflamed gum tissue, various types of treatments will be necessary. For example, inflammation leads to pockets, and pockets impede dental hygiene, thus leading to further inflammation. We can stop this vicious cycle with proper periodontal therapy. We begin by taking a periodontal status, measuring the depth of the pockets, the degree of loosening of affected teeth, the severity of the inflammation. Following this treatment, inflammation will usually recede within one week and the depth of the pockets will decrease significantly. It is possible that the periodontal pockets will have disappeared completely by then. If there are still deeper pockets or loose teeth after the first treatment, surgical measures are usually required. Curettage and deep scaling is a treatment in which we remove the inflamed tissue from the inside of the pockets and also the hard plaques from the surface of the roots. 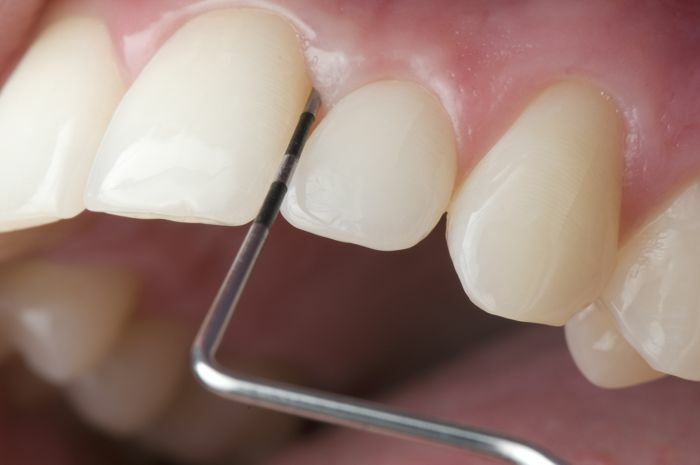 Gingivectomy is a treatment in which we remove the pocket itself. Gingivoplasty is a treatment in which we re-shape the gum tissue. Besides the treatment mentioned above, deep periodontal pockets may require surgical procedures or reshaping of the surrounding bone tissue. In case of extensive loss of gum tissue, we offer various other plastic periodontal surgical procedures such as transplantation of gum tissue, etc. All surgical procedures will be performed under local anaesthesia and are pain-free. Some will be performed with an electronic device . After anaesthesia subsides, patients might experience pain, which, however, can be controlled by pain medication. Altered cosmetic appearances, especially in the front, are not likely. In most cases, there will even be postive cosmetic consequences after a periodontal surgical treatment. It is not always possible to completely cure damage that has perhaps existed for over a decade. However, we can reduce tooth loosening and gum inflammation and reduce periodontal pockets. By doing so, we enable you to perform successful dental hygiene again. After the treatment, we reccomend that you participate in our prophylaxis program and recall sessions. If you continue with good dental hygiene, the risk of a relapse is very small and further treatment should not be necessary for a long time. This is only a short survey of treatment possibilities. We will be pleased to provide you with further information during a personal consultation.